Even in this tight economy, where so many people are looking for jobs, it’s still not easy to find candidates with the ideal characteristics of a quality employee—like a hard work ethic, a can-do attitude and industry expertise. Making matters more difficult, employers often need to find workers fast. And nobody wants to hire the wrong individual, as high turnover rates can cost thousands of dollars, spook clients and negatively impact office morale. What’s more, you are balancing an already jam-packed schedule. You have trade shows to plan, meetings to attend, deadlines to meet and year-end budgets to complete. How will you ever find the time to work with HR to find a replacement? The answer is through Web conferencing. With the help of an advanced Web conferencing platform, you can interview candidates when you’re not in the office. Onstream Meetings for instance, a robust Web conferencing platform with over 100 features as well as audio, video and Web-based chatting, will provide you with all of the tools you need to thoroughly vet incoming applications for quality purposes from wherever you happen to be. Further, using Onstream Meetings, you can invite other members from your team to join conferences for group chats, which can facilitate well-rounded interviews. For example, you may need to bring in a software engineer to ask hard-hitting questions of developer candidates. The more opinions you garner during the interview process, the better off you will be. And Onstream makes it easy to round up co-workers when they are needed; all you need to do is send them a link to a meeting you’d like them to join. Are you ready to streamline the hiring process? 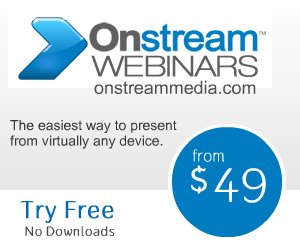 Click here to get started using Onstream Meetings today!